Before anything else, let me teach you how to properly pronounce Biore. It's /bee-your-ray/. Okay, now that we got that right, let me now share with you guys a fun event I went to last week. 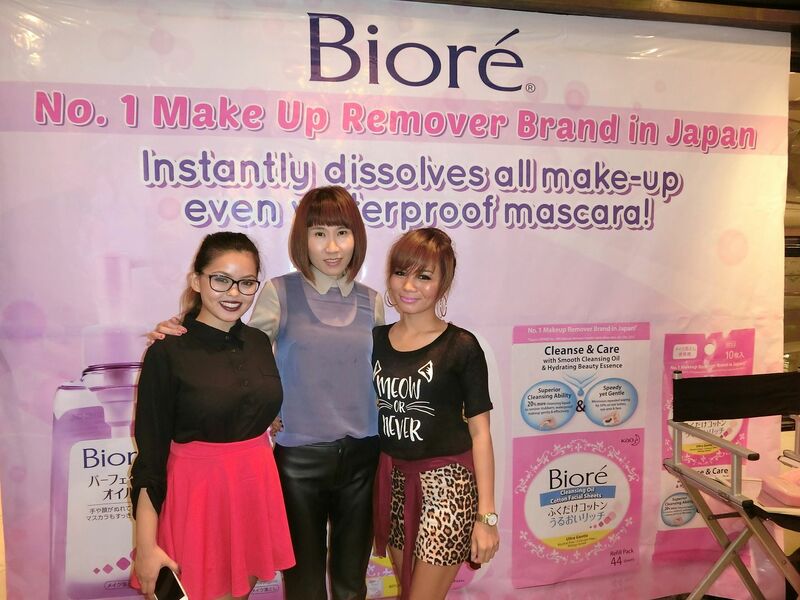 So, Biore, the #1 makeup remover brand in Japan, is now officially in the Philippines. 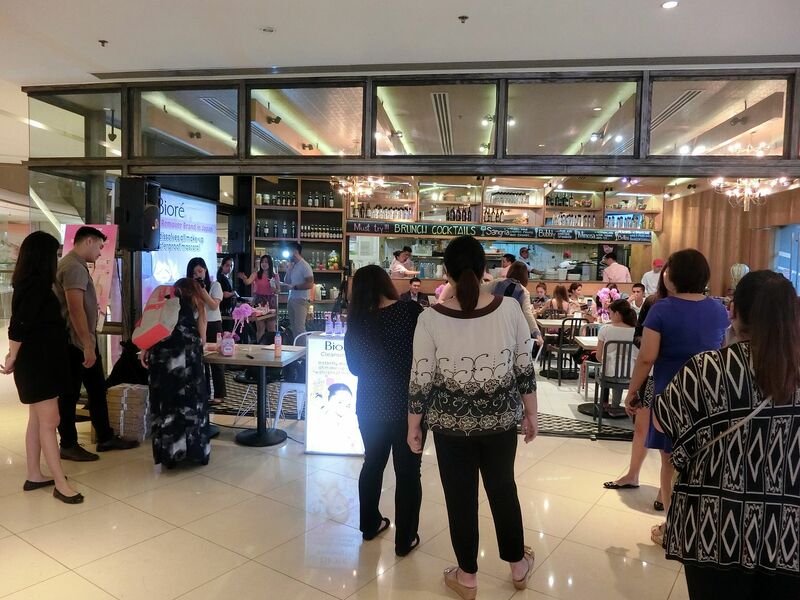 I was lucky enough to be a part of their fun event at the Spatzle Euro Cafe in Shangri-La, Mandaluyong. Another issue - don't you guys sometimes feel lazy whenever it's time to remove makeup? Especially those layers of foundation, powder, waterproof mascara, heavy eyeliner, matte lipstick plus oil and dust? I honestly do! I also dislike when I have to rub my eye area with soap, cotton and makeup remover just because my thick waterproof mascara just won't let go. I have tried a lot of makeup remover brands that promise to remove makeup quickly but I was left disappointed. 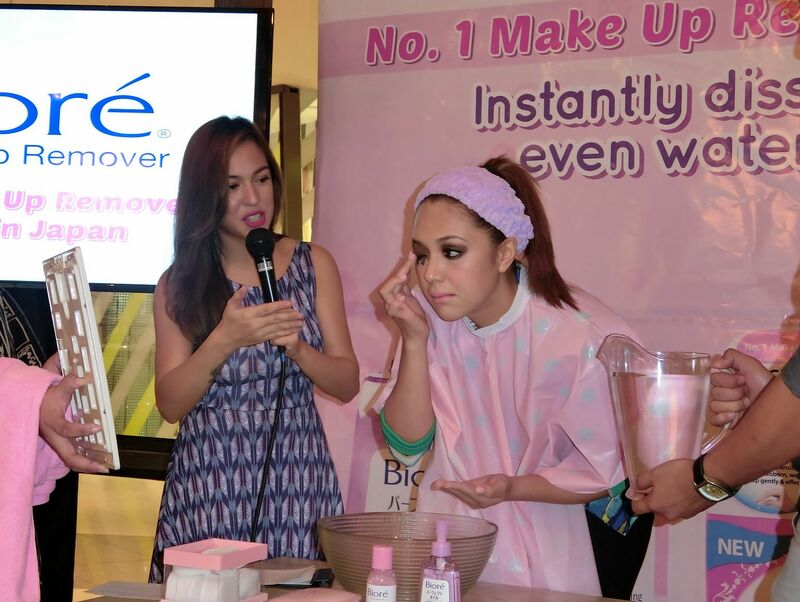 Aside from the overflowing Biore products at the venue plus awesome food and crowd, it was also graced with the presence (and makeup tutorial) of Jigs Mayuga! 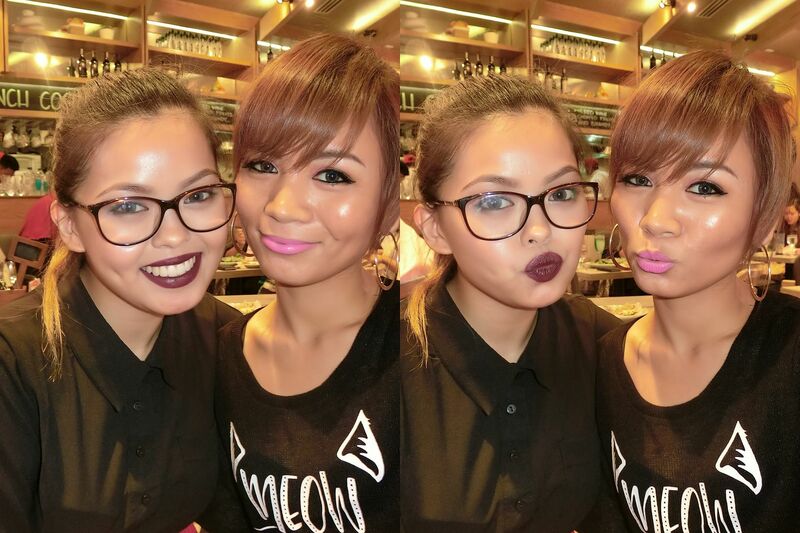 He is a well-known makeup artist of celebrities here in the Philippines. He demonstrated 2 makeup styles that day : Night Glam Makeup and No Makeup Makeup. I really want to learn more about makeup because I believe I still have a lot to learn so I payed close attention. It's not everyday that I get to listen to and watch a live tutorial by a famous makeup artist so I didn't want to waste the chance. 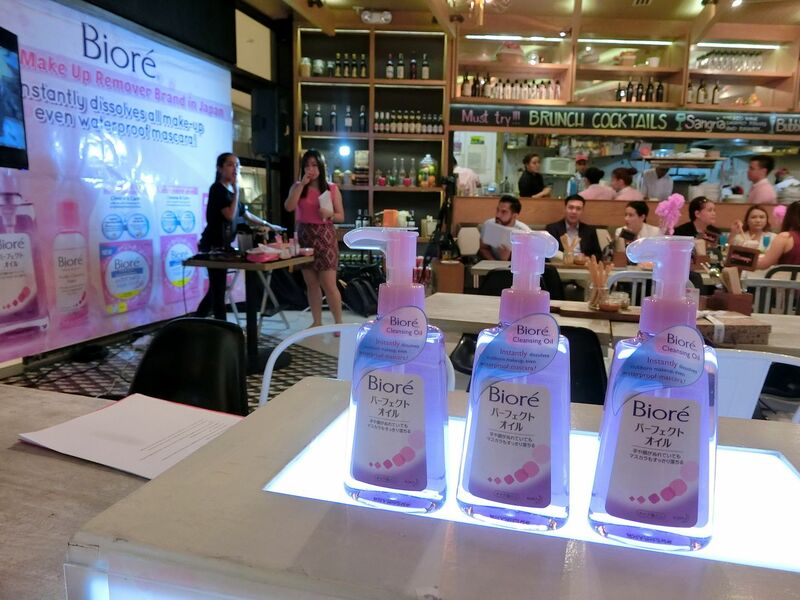 After the demo, Ms. Christabel Low of Biore talked more about the Biore products. She talked about how Biore works and why it is super effective and popular in Japan. 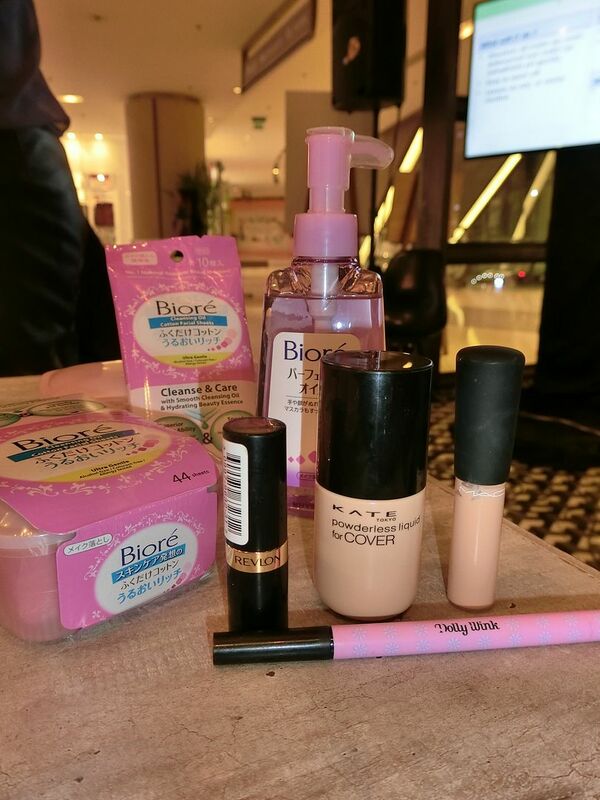 She then demonstrated how to use the Biore makeup removers.  Here are some hard-to-remove makeup like Revlon Lipstick, MAC concealer and Dolly Wink Liquid Eyeliner. I love liquid eyeliners that stay all day but I dislike it when they are soo hard to remove.I remember there was one time, some of my eye lashes fell off because I used a super waterproof eyeliner and then a waterproof mascara. I rubbed hard so my lashes fell off. Boo! 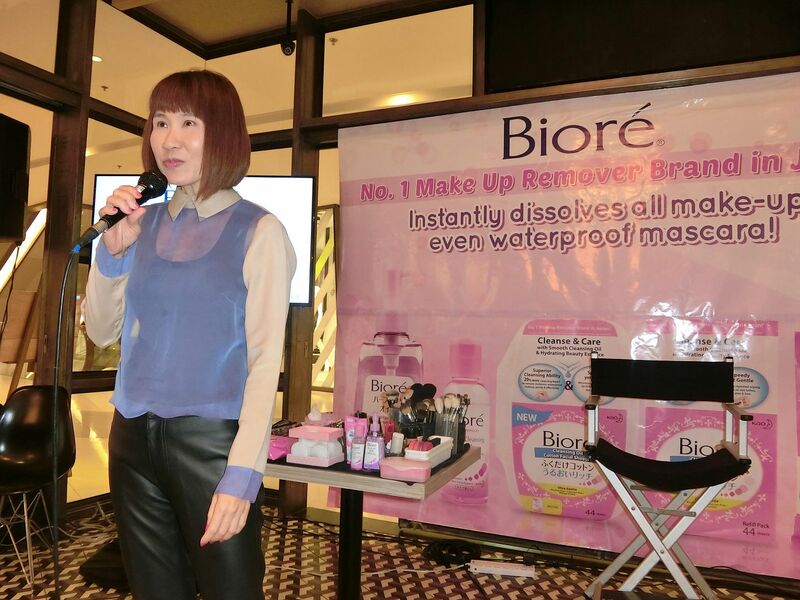 What sets Biore Makeup Remover from other brands is that it really works. Look at the example below. 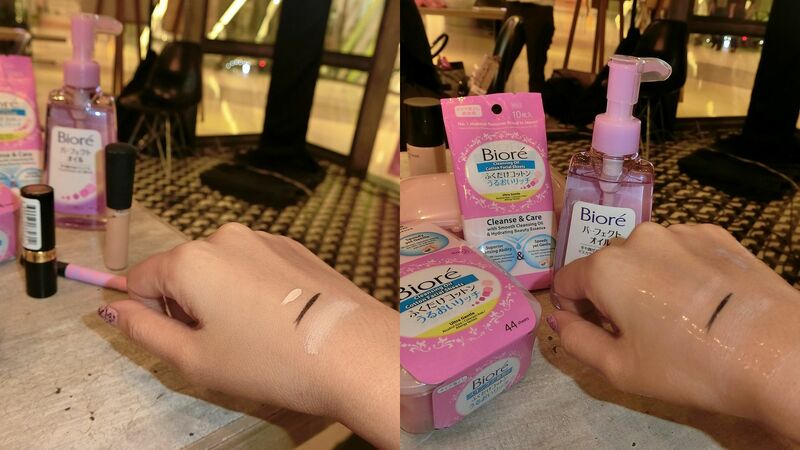 I applied the products on my hand and then squeezed Biore Oil Makeup Remover. Do you see how the products melted on their own? I did not even rub yet and they were already melting! And the reason why there was a makeup demo earlier? 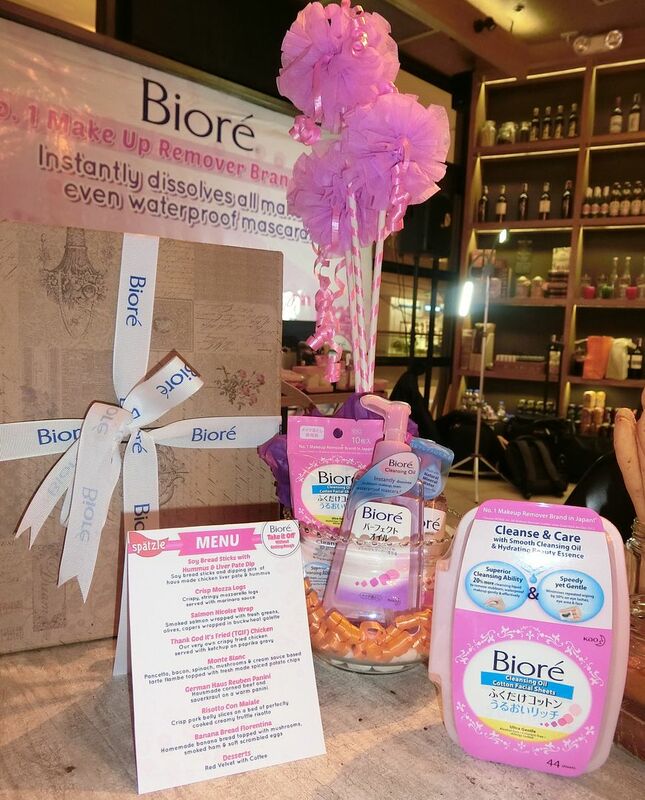 It's actually for the Biore Makeup Remover demo. So the model had smokey eyes, right? She also used the Biore Oil Makeup remover and applied it on her eye area. Within seconds, her thick makeup was gone! Amazing! Of course, I took the #TakeItOffWithBiore challenge as well. But I couldn't do my eyes because I was going somewhere else after that. Instead, I removed my MAC Pink Nouveau lipstick. It's a matte lipstick that stays for hours. But when I removed it using Biore Makeup Remover Wipes, it was gone in seconds! 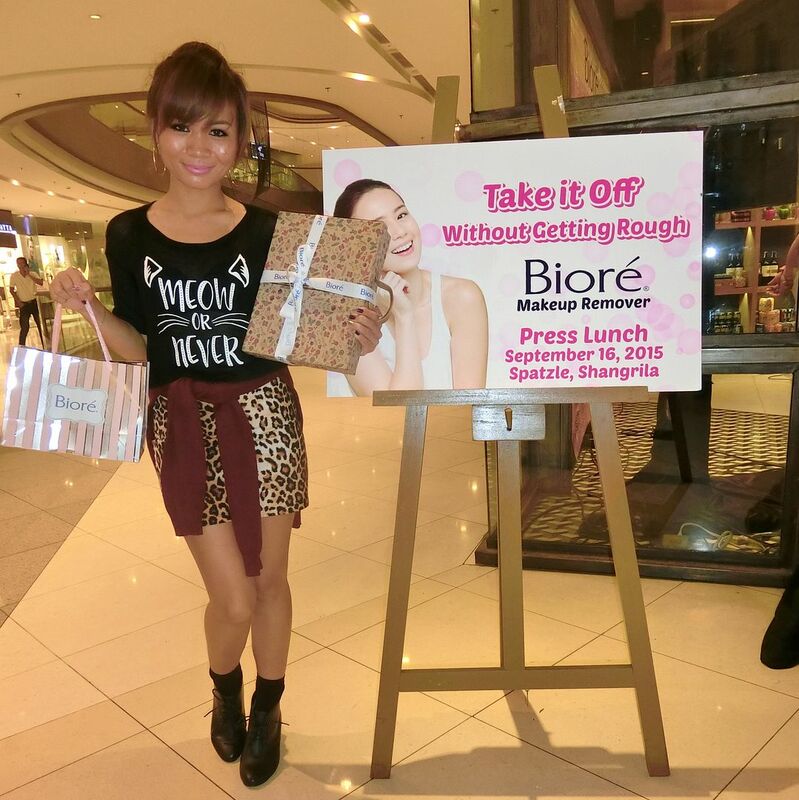 With Ms. Kris of Biore and my ever partner, Ana. I love working with Ana because she's easy to get along with. I hope we have more projects together! The most memorable ones were the YouTube Fanfest, Cetaphil Experience and the Beauty Bound Asia. 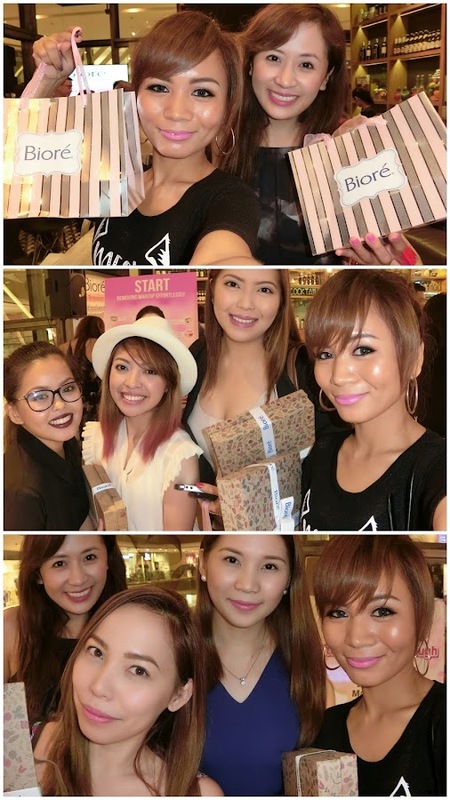 Now, we met again for the Biore launch! 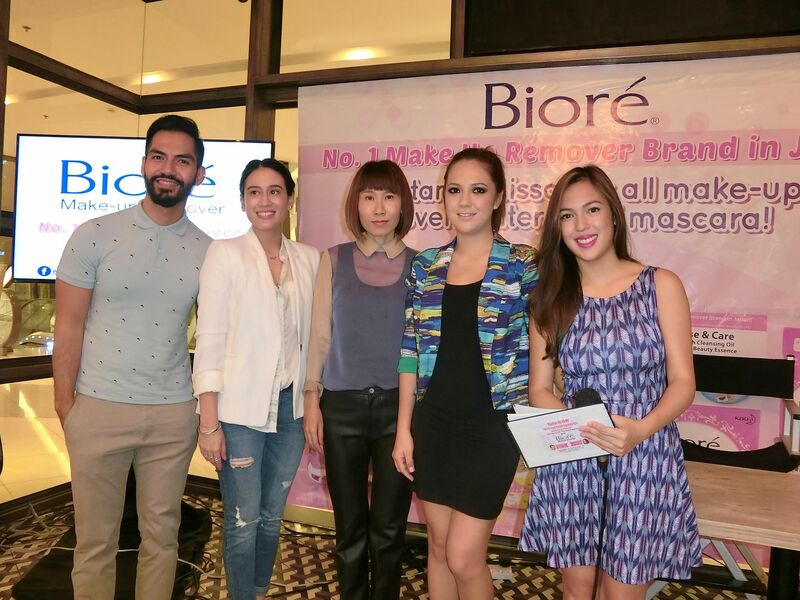 Just some of the amazing people present at the Biore Launch! My favorite event partner, Ana Victorino. Brown hair, MAC lips and black top! Also took a photo with Jigs Mayuga and the event's host, Karel Marquez. Also took a photo with the other bloggers present at the event. Yay for a good makeup remover that is now available in the Philippines. You won't have to order it online or go to Japan just to buy some. They are now available at Watsons and other drugstores here in the Philippines! 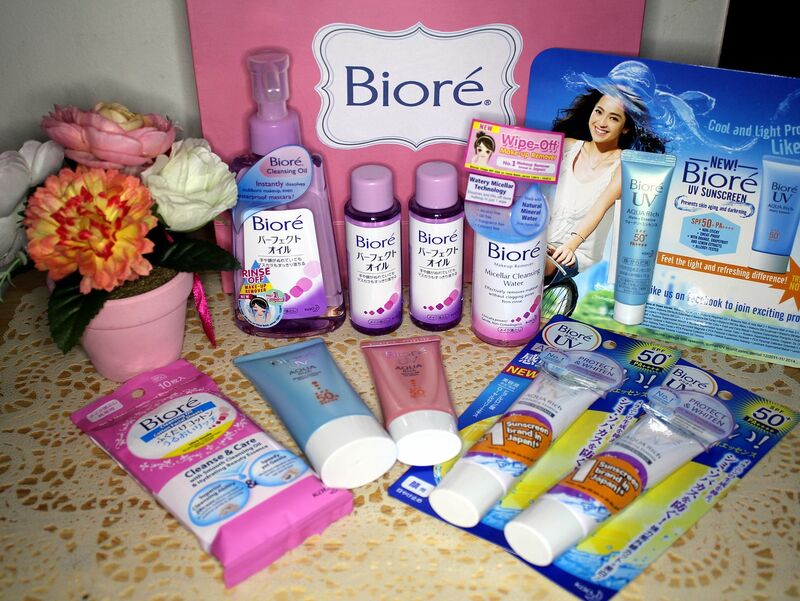 Check out Biore official Facebook page HERE for more updates and more beauty tips!